Making a Master Stock is a time honoured craft. Although incredibly easy, the art is in fine tuning the combination and proportion of the flavouring ingredients as you use the reserved stock a second, third… one thousandth time! There are reports of Chinese master stocks started 150years ago. 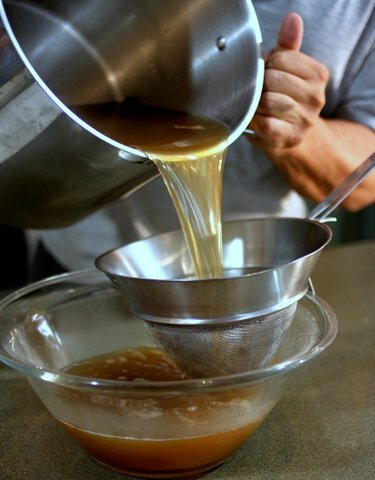 For you to start the journey of creating an ever improving master stock, just be prepared to add more of the flavouring ingredients when you feel they are flattening out between uses. How does a stock keep that long? Either do as the Chinese do; once a week, take from the fridge, bring to the boil to prevent spoilage bacteria forming (or pre-fridge, use the stock every second day). You and I would never do this, so, freeze till next needed. You’ll have to take heaps of ginseng so you can live to 150. Every ingredient obviously has its particular contribution. 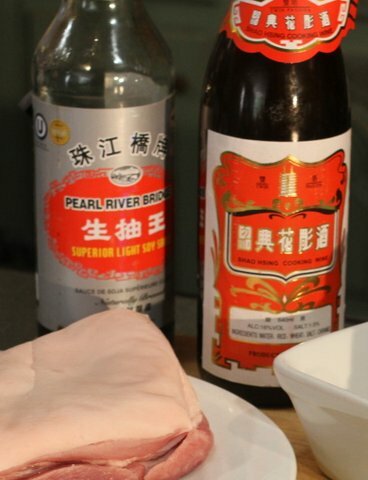 Whether it’s the salty depth of soy, the sweetness of brown sugar, the various perfume notes of ginger, star anise, black cardamom or cassia, the Chinese character of shaoxing wine or the savouriness of spring onion. You need to dial these contributing factors up and down according to your own palate. So, bring the stock up to the simmer, taste as you look wistfully towards the ceiling head tilted with eyes half shut. Then with a steady knowing hand add what you wish. Simmer 5 mins longer to see the addition has worked and proceed to submerge your pork. It’s all about balance, Grasshopper. Please research other master stock recipes and add or subtract ingredients from my list if they take your fancy. It’s great to personalise recipes. I like to heat the dry ingredients in the cooking pot with no oil. 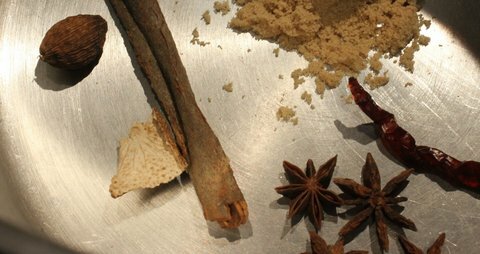 This always helps release the aromatic character of whole spices. Then tip in the sugar to quickly dissolve in the heat. Do not let burn. Seconds later, tip in shaoxing wine and it will splutter away, boiling off the little alcohol. Next, in with everything except the drumsticks and completely cover with cold water. Place on a medium to medium-high heat. Bringing meats to the rapid boil only shrinks, toughens and dries out your final product. Skim the surface of impurities, grey foam usually, being careful not to remove ingredients. Put a lid on the pot and turn the heat down to a very low setting and check the liquid. Once settled under the lid, is only barely murmuring and occasionally breaking the surface. 30 mins later fully immerse the drumsticks and make sure everything is submerged. Add hot water from the kettle if needed. Cook as before for a further 20mins then switch off the heat and leave the pot for at least 1 1/2 hours. Remove the chicken and pork. The chicken and pork can be eaten in many ways, taking shape into many recipes, which I will gradually upload onto my site. The reason it’s here as a separate recipe is because I would like you to consider the meats as a stand alone ingredient. Whether you have the chicken cold with a sweet chilli sauce watching a movie, the pork with Asian greens and steamed rice or either one heated on a BBQ with an Asian coleslaw… Every time, the chicken and pork act as a stand alone starting point to your cooking occasion.